Closing the distance gap for distributed teams is a tough proposition. But today, distance can’t be a barrier for any organization that wants to innovate and compete globally. In fact, 62% of workers are already saying they collaborate regularly with people in different geographies. • been the only one to call in and felt your team forgot that you’re there? • heard the team brainstorming at a whiteboard, talking about content you can’t see? • had people in the room talk over each other so the conversation is gibberish? • experienced jerky or dropped connections breaking the conversation flow? • the person on the phone distracted you with his dog’s incessant barking? • the videoconferencing suite in your office felt like a United Nations meeting? • what you presented not been captured because the camera was pointed down? Steelcase calls this presence disparity Unfortunately, it’s all too common a problem in today’s workplace. In fact, 79% of video conferences still occur in antiquated, formal conference rooms that were never intended for collaborative team work. Which is too bad because the end result can be frustration, loss of productivity and stress. 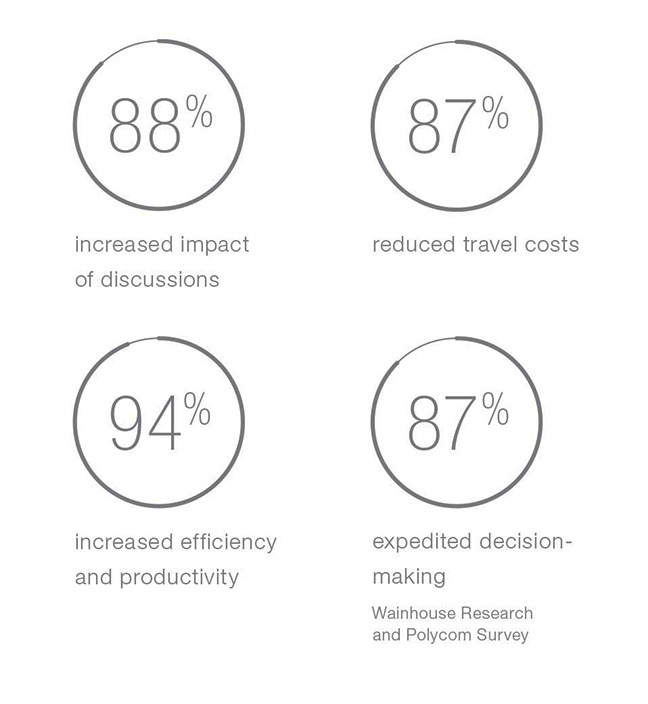 Video conferencing systems can be powerful tools with benefits like reduced travel costs and expedited decision making. 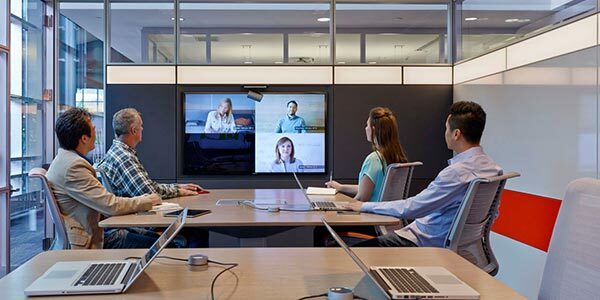 Designers need to take into account many factors in crafting video conferencing spaces. For example, Steelcase researcher Ritu Bajaj, notes that our behavior on video is less natural if the environment is not well designed. 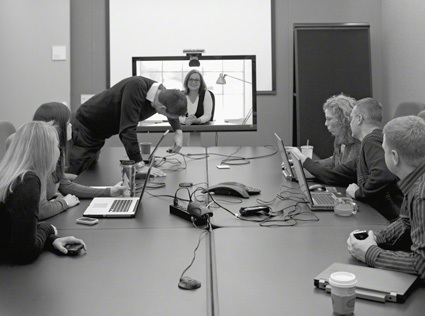 “We saw that people tend to behave in a very forced and formal way during telepresence meetings. They sit up very straight, as if they’re TV news anchors, and are reluctant to move,” she explains. Researchers also find that making eye contact is difficult for people who tend to look at the screen rather than at the camera. Thus, paying close attention to camera angles and position can help create the effect of people looking at you during video conferencing. When behavior, technology and physical space are integrated together in ways that are appropriate for the collaborative efforts at hand, there are ways to close the gap between distributed teams. Consider camera and microphone placements carefully. Develop a layout that allows all users to be on camera and clearly audible. Include multiple screens so participants can see each other and their content at the same time, making sure people can move and stay on-camera without disrupting the flow of interaction. Create zones that allow people to move fluidly between group work and privacy. People in collaborative teams make quick switches between these modes throughout the day. Glass walls within the room can create acoustical separation while supporting continued visual access. Enclaves immediately adjacent to the team space allow team members to get away without going away. Design the environment to encourage movement and a range of postures so that participants can stay energized and engaged. Stool-height tables encourage standing up and staying on camera, or make it easy to transition off and back into the conference. A lounge setting with a video conferencing system is another effective way to encourage movement and informality. Think about both sides of the experience. Provide similar environments in all locations, equipped with the same level of tools and technology controls. 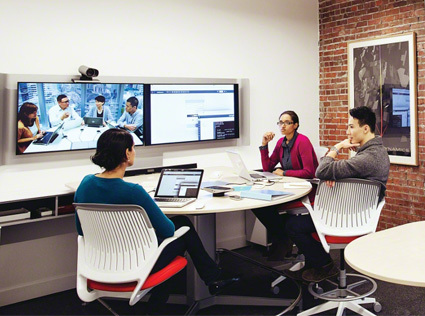 Incorporate abundant display surfaces, both analog and digital, to help distributed teams develop a shared mind. Consider how the space can help build trust. For instance, just outside the team room, a “wormhole”—a continuously open, real-time video connection that acts like an open window between two locations—can help promote social exchanges as people come and go. Plan for a range of team sizes and videoconferencing exchanges. One-on-one interactions, paired work and collaboration among subsets are as important as full team sessions. Distribute as many choices as possible—videoconferencing kiosks adjacent to the team space, nooks within it and even mobile solutions—to leverage real estate and encourage use of the technology. For more information on video conferencing systems check out our Featured Solutions.